Remicade is a biologic drug that is used for various health problems. I have to be given Remicade for my ulcerative colitis, which I have already talked about in a previous post. 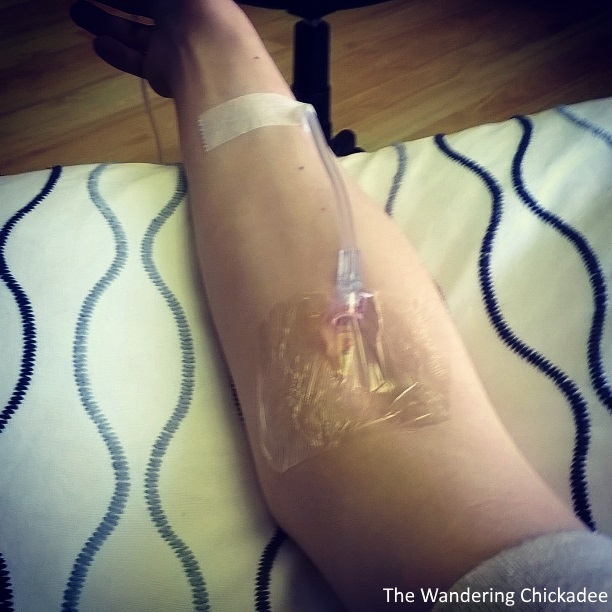 Some of you might be wondering what it's like to go for an appointment to receive Remicade since it is a medication that needs to be administered through an IV. I'll reveal it all to you in this post! A very important thing that I have to do on the day of the appointment before I even go to the clinic is drink lots of water. The reason for this is to get the veins ready so that it's easier to put the IV in. So, you can bet that I take this step very seriously since I want that IV to go in as easily as it can and I don't have to get poked several times to get the IV in. When I go for my appointment, I go to a clinic that is quite small and cozy. There are four comfortable chairs set up for people receiving IV medications so there will be a maximum of only four people there at a time for appointments. The room feels a bit like a living room which is the atmosphere that these specific clinics are going for because they want to get away from the uncomfortable or scary hospital setting. They want people receiving IV medications to feel comfortable. When I get to the clinic, I sit down in one of the chairs and prop my arm up on a pillow that I place on top of the arm rest. When the nurse is ready with everything needed for the IV and for doing a blood test, she inserts the IV into my arm. My right arm has a really good vein so I think that I'll keep using that arm for the IVs since the veins in my left arm aren't always the greatest. I used to get really freaked out with IVs and I still get nervous while the IV is being put in. My breathing goes a bit weird, I start sweating, and I might even start shaking a bit. I'm not as bad as I used to be though. IVs aren't really scary once you understand that the needle is inserted simply to get a very tiny plastic tube inserted into the vein and then the needle is taken out so that all that is left in the vein is the plastic tube. The tube is very flexible so that you can can still bend and move your arm. I guess I'll just get more comfortable with IVs being put in with the more that I get. Before hooking up the medication, the nurse takes some of my blood through the IV for a blood test (because the medications that I'm on can have internal side effects so my doctor needs to keep an eye on everything) and then she hooks up the plastic tube through which my Remicade drips into my bloodstream by gravity. After the IV and Remicade is all set up, the nurse usually asks me if I'd like a hot beverage (I'm a tea drinker so I never refuse a cup of tea) and I get comfortable to spend 2-3 hours there. There's a TV set up in the room with Netflix if any of us receiving medication feel like watching TV episodes or movies and there are always plenty of snacks. I like to take the time to read or write and meditate. I think of it as some personal relaxation time. There is usually only one main nurse at the clinic and she is super nice and really good at setting up IVs. I also love how the nurse calls us clients rather than patients. It makes us sound like we're going for some kind of professional meeting rather than a medical appointment. It also makes things sound less scary. Throughout my time at the clinic, she adjusts the dial on the IV tubes to control how fast the medication drips. After 2 or 3 hours have passed and the bag of Remicade has completely drained into my bloodstream, the nurse removes the IV and I am all done! When I leave the clinic, I feel fine. Some people get the common side effect of feeling tired while others don't feel tired until the next day. Sometimes I feel more tired than usual the next day so I make sure to take it easy. The nice thing about Remicade is that I only have to receive it every two months. Not too bad, huh? Especially when you think about how some people have to take pills every single day. Those people have to take pills because the pills work for them, though, whereas the pills were not working well enough for me so I needed something stronger. Well, I hope that sheds some light on what it's like to go for an appointment to receive Remicade (or other IV medications). Maybe now it won't freak you guys out as much if you ever have to receive an IV medication or if you hang out with a family member or friend while they receive an IV medication. I've noticed that people are sometimes kind of nervous when they are sitting with or visiting someone at the clinic who is receiving an IV medication. I understand that these medications are strong and are given through an IV and are kind of a big deal but those of us who receive these medications get used to receiving them and it becomes not so much of a big deal to us.